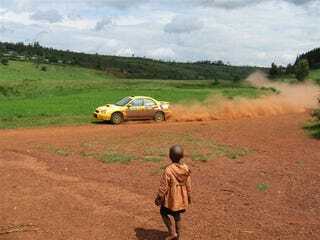 Rwanda is not all about machete-flavored genocides, tall people with cute French names, and mountain gorillas living on volcanoes: they host a round of the African Rally Championship. Last weekend, it went very wrong. When you think about it, a death at a rally shouldn’t be very surprising. After all, this is the sort of activity where spectators line the track not on historic photos but to this very day, and not just in Rwanda but at every event, in some cases leaving the road only to let the cars pass. What’s surprising is that most races end with zero casualties. Apparently, the guys who get paid to control overpowered racing cars on slippery gravel know more about dabs of oppo than you or I ever will. Not much is known about what happened at the Rwanda rally, other than that a Kenyan driver ploughed into the crowd at night, killed two spectators and injured 14 more. Sad news, really, especially in light of some photos which have popped up on local blogs, as the rally was not the usual mix of Ford, Citroëns, Subarus, and Mitsubishis, but a wonderful menagerie of vintage rides, including this Datsun 260Z pictured at Amahoro Stadium in Kigali.